A truly remarkable hand-made book with all 18 major wins in genuine leather bound investment-grade limited edition portfolio. For the true collector and Nicklaus enthusiast. About The Portfolio- All 18 Majors: From day one, Walt Spitzmiller and Jack Nicklaus wanted to present something truly remarkable that would bring all 18 major wins together in one retrospective book. This is it. The great moments of his major wins and accompanying descriptions are all captured in a limited edition of 100 handcrafted, genuine leather bound investment-grade portfolios. The portfolio is a “big book.” It includes all 18 full size (18” x 24”) Giclee prints with historical text pages by award-winning golf journalist and author, Don Wade. The portfolio is a true work of art in its own right. Walt wanted to create a book in the “old style” - a true one-of-a-kind illuminated manuscript. With full size prints, it is impressive in its size and unmatched for the quality of every element of the finished product. It is printed on heavy acid-free museum quality art paper. Each Giclee is made one at a time and carefully reviewed by the artist for superior reproduction, fidelity and color before binding. The page facing each print carries the supporting historical text prepared by the preeminent golf writer and historian, Don Wade. The "story" page is printed on heavy-grade, opaque acid-free paper which also serves to protect the print. The portfolios are hand made one at a time and bound in exquisite genuine leather with a silk lining on the inside front and back covers. The binding is done by a true old-world craftsman. Details such as the Jack’s Majors Logo is gold hot stamped on the portfolio cover and on the inside title page. 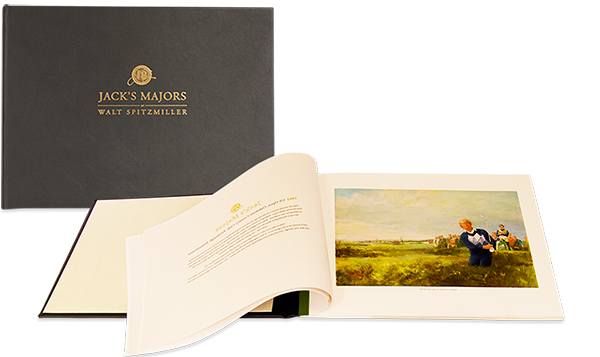 The portfolio is presented in a heavy outer presentation box with a hot-stamped Jack's Majors logo to protect it in shipment, handling and storage. Further protection is ensured by a pair of white conservator's gloves sent with each portfolio to safeguard its value while being viewed. Finally, each portfolio is personally signed by Jack Nicklaus and the artist and include the Jack Nicklaus hologram certifying its authenticity. In addition, there is a separate certificate of authenticity for the buyers records. For the serious collector, this is the book to own. Jack Nicklaus recorded one of golf’s greatest achievements and the Jack’s Majors Portfolio was made to fit the measure of the man and his unparalleled accomplishments. The portfolios numbered from 1 to 100 are priced at $5,000.00 and are issued on a first-come, first-served basis. The domestic shipping and handling fee sent next day air via FedEx is $250.00. International shipments are quoted based on destination.